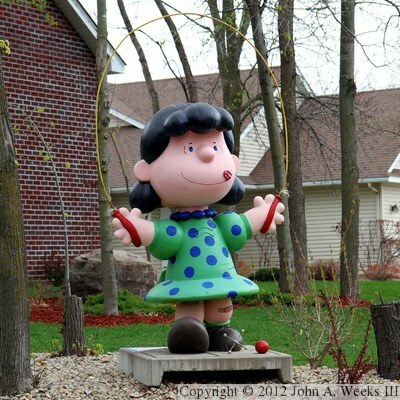 The Charles Schulz tribute continued in 2002 with ‘Looking For Lucy,’ a series of 105 five-foot tall statues of Peanuts character Lucy Van Pelt. Despite being a little cynical and having a very demanding personality, Lucy had a wide variety of interests that makes her very believable in all of the roles portrayed by the tribute statues. 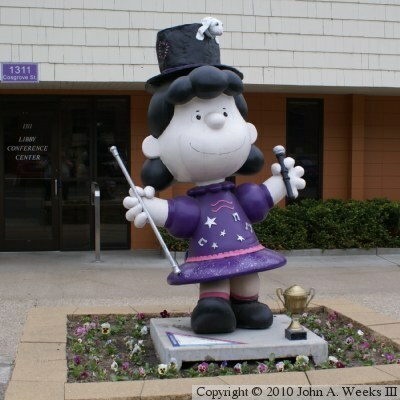 This Lucy statue is known as ‘Grandma Maggie.’ She was designed by artist Keith Krone and was sponsored by Keys Cafe. 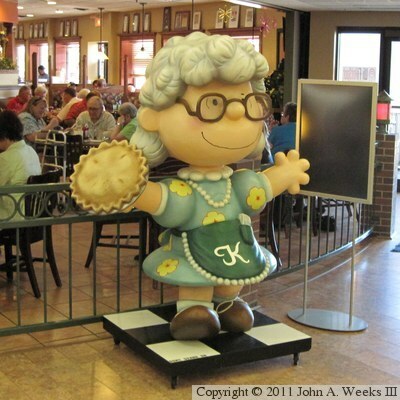 Lucy is modeled after the grandmother of the family who owns Keys Cafe. Grandma Maggie loved to bake, so Lucy is shown wearing an apron and holding a freshly baked pie. The statue is on display at the Keys Cafe in Woodbury. 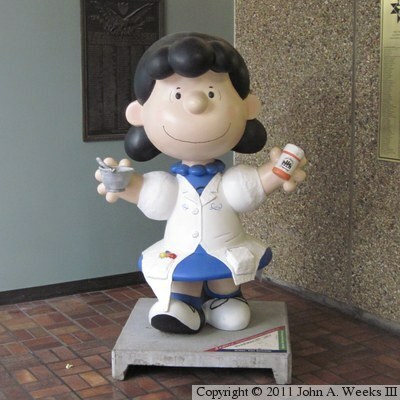 Pharmacist Lucy is on display in the tunnel connecting connecting Moos Tower and Weaver-Densford Hall in the University of Minnesota Hospital complex. The tunnels are open to the general public and can be accessed from the street level, from the hospital, or from the parking ramp. 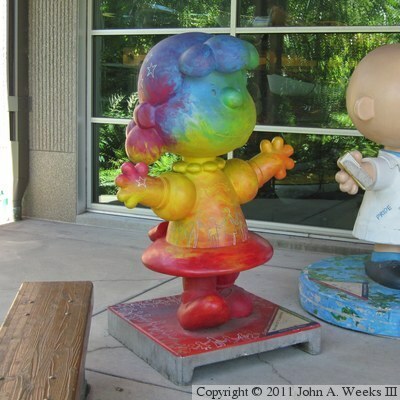 This Lucy was designed by artist Tim Schmitt and was sponsored by the West Seventh Pharmacy. 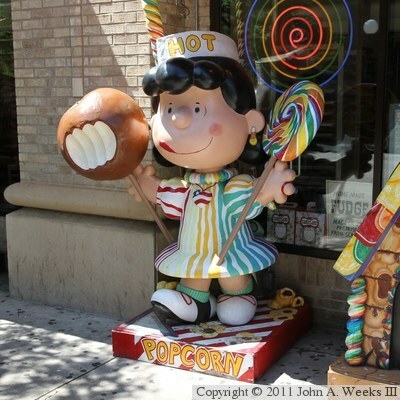 Sweeten Up Lucy is one of three Peanuts statues on display in front of the Candyland store on Wabasha Street in downtown Saint Paul. 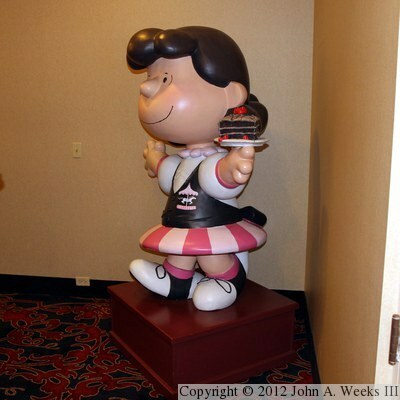 This Lucy was sponsored by Candyland and was designed by artists David Brown and Pam Ruiz. 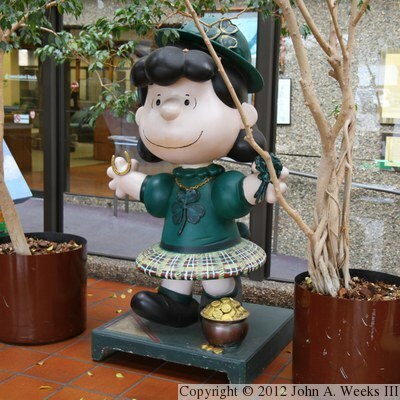 ‘Lucky Lucy’ is one of four peanuts statues on display at the Associated Bank at the corner of Snelling and Selby in Saint Paul. This Lucy, sponsored by O'Gara's Bar and Grill, and designed by artist Duane Barnhart, depicts our heroine complete with a horse shoe and clover leaves, which obviously must have worked given the pot of gold at her feet. Extra! Extra! 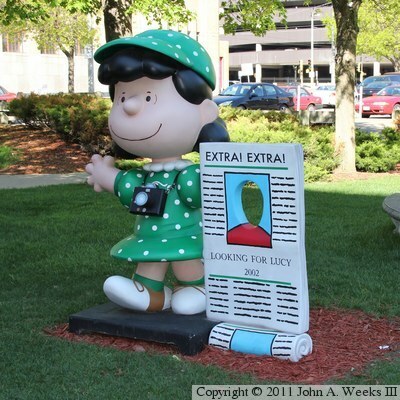 Lucy was designed by artist Max Haynes and sponsored by the Minneapolis Star Tribune newspaper. She is located in a small park area across the street from the Star Tribune headquarters building in the 400 block of Portland Avenue in downtown Minneapolis. Mein Liebchen Lucy, designed by artist Carol Halloran, is on display at the Church Of The Assumption in downtown Saint Paul. Translated, this means ‘My Love Lucy.’ The church was founded by German immigrants in the mid-1800s, so they sponsored a German-themed Lucy. This Lucy statue is known as ‘View From The Carousel,’ a reference to the carousel at Como Park. This Lucy was designed by artist DeAnne Parks and was sponsored by the Radisson Riverfront Hotel. It was found on display in the ballroom level of the Crowne Plaza Hotel in downtown Saint Paul at Kellogg and Wabasha. 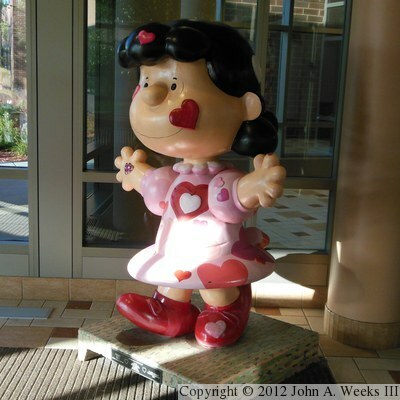 Lucy In Love is one of five Peanuts statues on display at the ProX Pharmacy at 5th and Marie in South Saint Paul. She was sponsored by the pharmacy and designed by artist Barbara Bjornson. 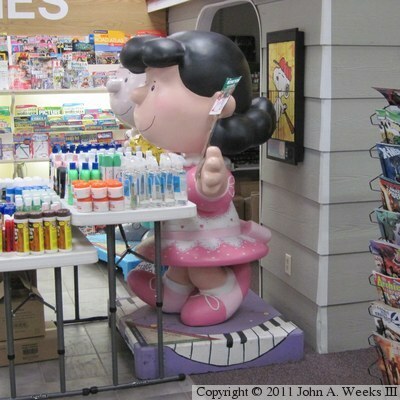 The pharmacy often incorporates Lucy into display, as we see here, or dresses her for the season or special events. This statue is known as Lucille Acceleration Minnesota. It was designed by artist Joel Dirnberger and was sponsored by Xcel Energy. It is currently on display at the University of Minnesota Children's Hospital at 2450 Riverside Avenue in Minneapolis. The statue originally featured Lucy holding a guitar and sporting blue suede shoes. 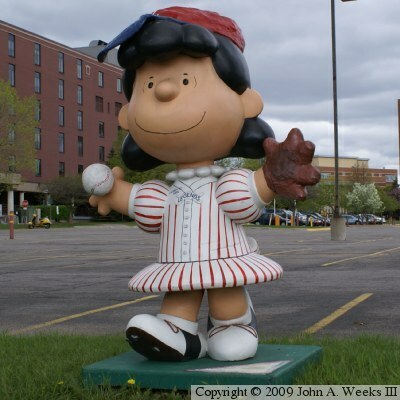 Here we see Lucy as ‘Queen For A Play,’ a reference to her position as an outfielder on Charlie Brown's baseball team. The Queen was designed by artist Carol Halloran, and was sponsored by Meritex Enterprises. She is on display in Lafayette Park near the north end of the Lafayette Bridge near Meritex's headquarters. Lucy CEO was designed by artist Anthony Hernandez, Jr., and was sponsored by Lawson Software. She is currently on display at the entrance to the University of Minnesota Hospital at 500 Harvard Street in Minneapolis. 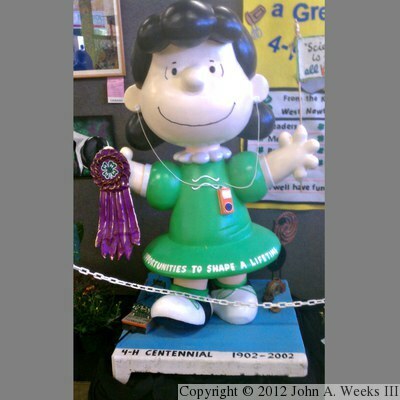 The Minnesota 4-H sponsored this Lucy statue, named ‘4-H Centennial Lucy’, to commemorate the 100th anniversary of the 4-H, which started in 1902 in Ohio and Minnesota and rapidly expanded both nationally and to other nations across the globe. This Lucy was designed by artists Bill Svendsgaard and Kristen Berning. It is located inside of the 4-H building on Cosgrove Street along the east edge of the Minnesota State Fairgrounds. This photo was taken using a cellular telephone camera by my sister, Kathy Boland, since I had neglected to bring a camera with me the day we visited the State Fair. 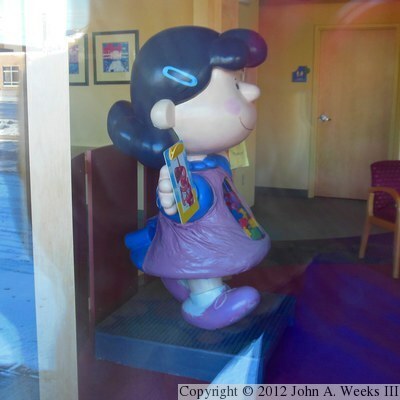 This photo is peeking through the window at 2200 University Avenue West, Suite #120, where the MN Gastroenterology Pediatric & Adult Clinic has ‘Gutsy Lucy’ on display. This statue was designed by artist Ann Dickinson, and it was sponsored by the clinic. The interesting feature of this piece is that Lucy has a cut-away abdominal cavity where you can see all of her internals, which are mostly a collection of colorful toys. 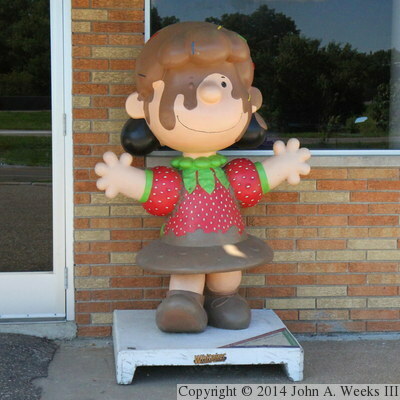 Lucy is portrayed as a chocolate covered strawberry in ‘Lucy Loves Chocolate’, on display at the Whitaker Sports & Classic Car showroom in Maplewood. The statue was sponsored by Maud Borup Inc, then known as Maud Borup Chocolates. Maud Borup began making candy in her Saint Paul home in 1907, and the company continues to this day, with a newly opened factory in Le Center, MN. 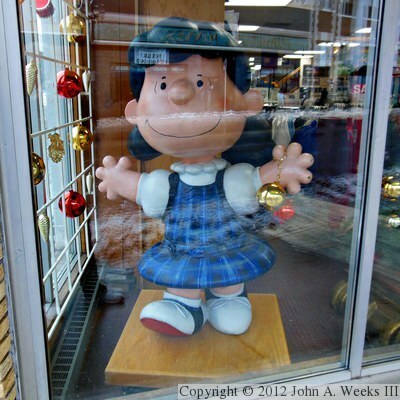 ‘School Girl Lucy’ is on display at Donald's Uniforms in Saint Paul. She was decorated for the holidays when I found her located in the front window of the store. Unfortunately that makes for a tough photograph, but it does allow pedestrians on the street to see her as they walk down busy Payne Avenue. The artist, Jennifer Perry, was 12 years old when she created this design in 2002. Sponsor: College of Saint Catherine. 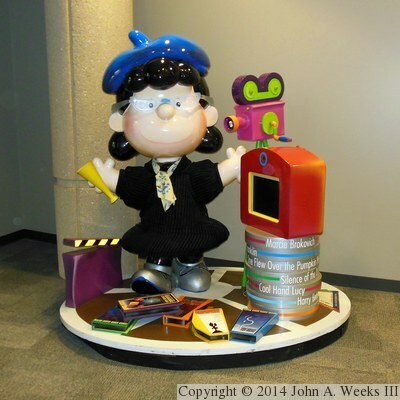 Leadership Lucy is on display in the Student Center at Saint Catherine's University in Saint Paul. Lucy is promoting the values of the school, which are learn, serve, excel, lead, and influence. Note that this Lucy is multi-cultural, with darker skin on her right side and lighter skin on her left side. 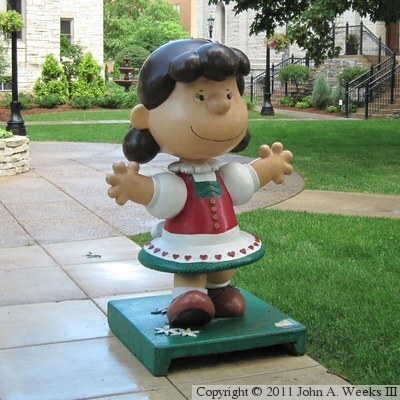 Leadership Lucy was designed by artist Danielle Ferrin and was sponsored by the College of Saint Catherine. Lucy Barton is on display at the entrance to the American Red Cross building at 176 South Robert Street in Saint Paul. 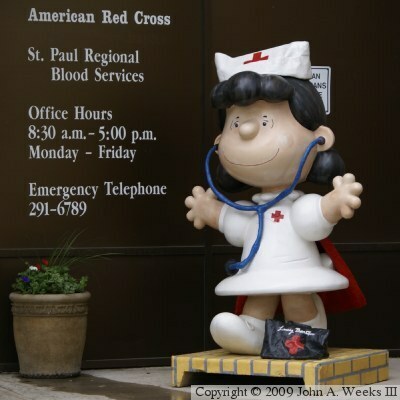 One of many medical themed Lucy statues, Lucy Barton was designed by artists Jodi Metz and Lynne Weber, and was sponsored by the American Red Cross. This is ‘West Side Flats Lucy’ is on display along the side of the Art Scraps store at 1459 Saint Claire Avenue in Saint Paul. 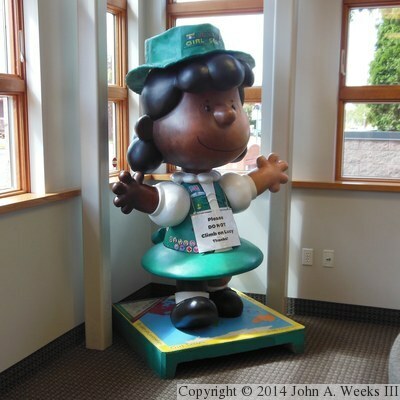 This Lucy was designed by artist Ta-coumba T. Aiken and was sponsored by DPRA Incorporated and Wellington Management. The paint scheme pays homage to the Mexican culture that existed in the West Side Flats area across the river from downtown Saint Paul before the area was cleared of housing following the mammoth flood in 1965. ‘Skip To My Lucy’ is on display during the warmer months of the year in front of a very beautiful brick home on Chalupsky Avenue in New Prague, Minnesota, about an hour south of the Twin Cities. 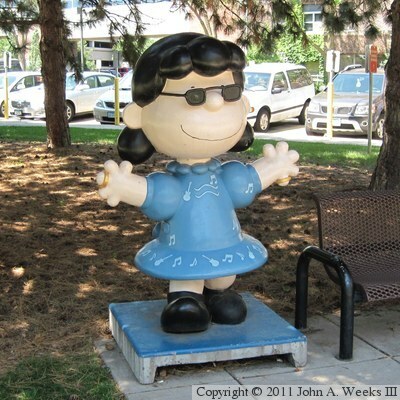 While many of the Peanuts statues show the characters in adult roles, in this case, we see Lucy as a grade school age girl. The statue was designed by artist Kim Cope, and was sponsored by The Saint Paul Companies (now known as the Travelers Companies). 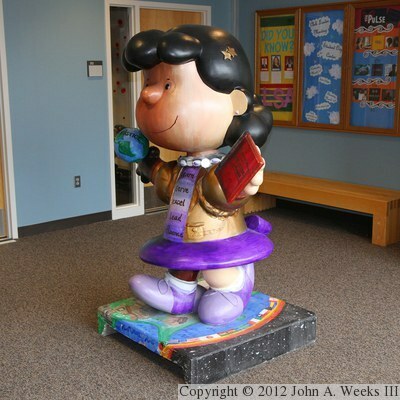 ‘Girl Power Lucy’ is on display at the Saint Paul Community College, along with a Linus statue. Lucy is located outside of the north entrance just west of the loading dock and truck parking area. 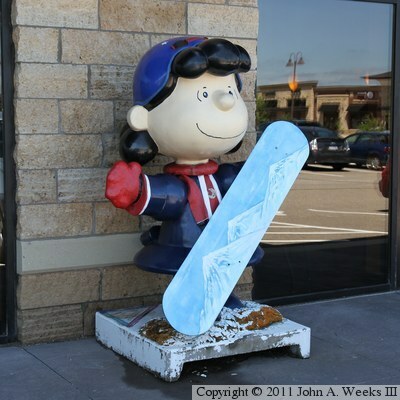 Lucy Goes For Gold is one of three Peanuts statues on display at the Woodbury Cafe just east of the Tamarack Road exit off of I-494. This is one of several statues that show Lucy as an athlete or explorer. This Lucy was designed by artists Sean Mumm and his family. It was originally sponsored by the Louisiana Cafe and Paisano's Pizza. 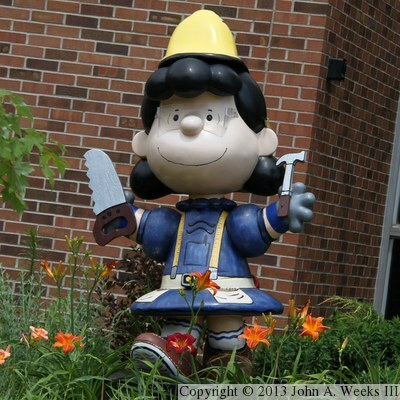 Here we see Lucy watching over a playground at Bayview Elementary School at 24 South Walnut in Waconia, Minnesota. This statue is named ‘Truffle Heaven’. It was designed by artist Amy Smith and was sponsored by Chocolat Celeste, known for its hand-crafted artisan chocolates. The statue was purchased at auction by Paul and Vici Scheuble. Lucy stands as a memorial to their daughter Lucy, who passed away two days after birth in 1999. The Scheubles donated the statue as part of an effort to establish a playground in Waconia. The community joined in and raised an additional $145,000, and then turned out in force to build the playground in only 5 days. 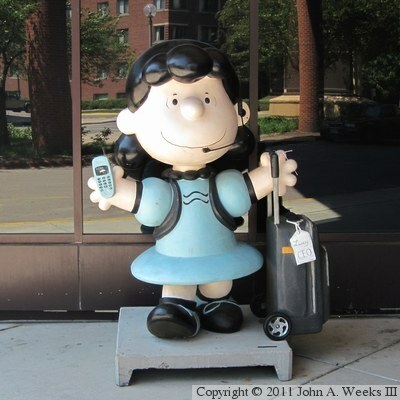 Lucy Van Pelt is the official greeter at St. John's Hospital in Maplewood, Minnesota, a northeastern suburb of Saint Paul. This statue was originally known as ‘We Love Lucy’, designed by artists Go East Design and James Kaump and sponsored by Touchstone Energy. The statue was purchased at auction by David and Mary Jo Monson. It was later reimagined by Danielle Ferrin of Fun Places Murals, with its original all pink, red, and white scheme replaced by a more traditional looking Lucy, but retaining pink, red, and white on her dress and shoes. Now known as ‘Lucy at St. John's with Diamonds’, she is very popular with visitors and often poses with families who have newborn children. Here we see Lucy as a Hollywood movie director, having recently produced blockbuster films such as ‘Silence Of The Beagles,’ ‘Cool Hand Lucy,’ and ‘Good Grief Hunting.’ Technology has changed since 2002, with DVDs and streaming having supplanted VHS tapes, and movie reels having been obsoleted by hard drives. Note that the Best Buy headquarters is not open to the general public. 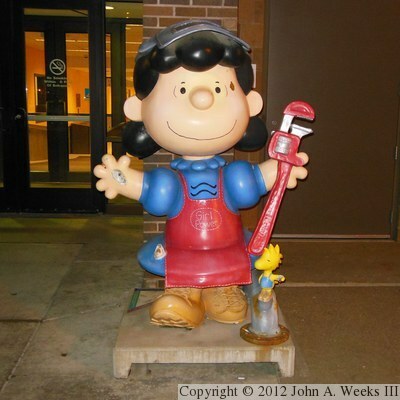 ‘Lucy Van Toolbelt’ was on display at the Kraus-Anderson Building in Saint Paul (near the Children's Hospital) following the Peanuts on Parade tribute series. In 2009, Kraus-Anderson Construction donated this statue to the Greater Minneapolis Crisis Nursery. With an additional donation from Life Time Fitness, a garden was developed in front of the nursery building on Glenwood Avenue to provide the children an interactive nature experience. The garden features vegetables, butterflies, a reading circle, and a reflection path. Update — the Crisis Nursery moved to south Minneapolis in 2014 at the corner of East 46th Street and South 4th Avenue, where Lucy is now located in a garden in front of the building. 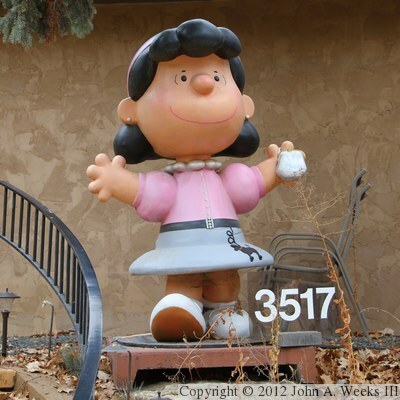 This statue, called ‘Little Darlin' Lucy’ is located in front of a home on 22nd Avenue in Saint Louis Park. Lucy is shown standing on top of an old style vinyl record album all dressed up for dancing. 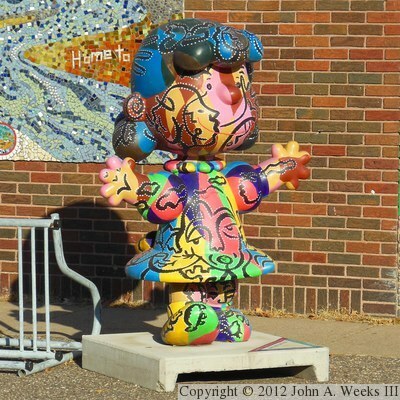 This Lucy was designed by artist Todd Julen and was sponsored by Sibley Manor Apartments. 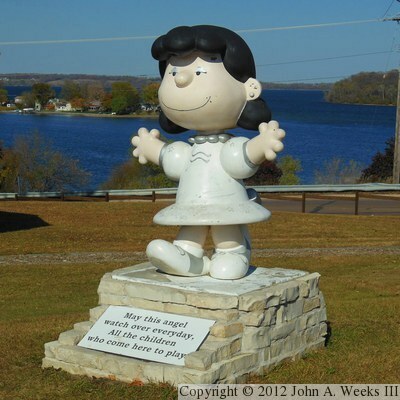 Super Star Lucy is one of five Peanuts statues to be designed by Neil Boltik and sponsored by the Minnesota State Fair. They are displayed on a rotating basis at the fairgrounds. This Lucy was on display outside of the Libby Conference Center just south of the main fair entrance on the day of my visit. 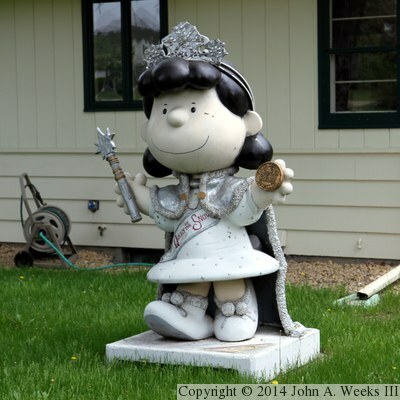 Lucy as the ‘Queen Of The Snows’ is on display at a private home in Saint Louis Park. The Queen Of The Snows is one of the central characters of the annual Saint Paul Winter Carnival. In carnival lore, the Queen is spouse of King Boreas, king of the winds who came across a winter paradise named Minnesota and made it the capitol of all of his domains. 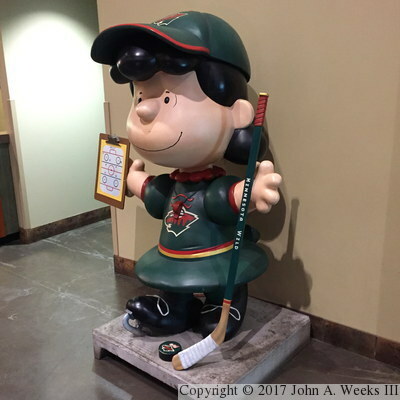 One of (5) Peanuts statues on display at the Xcel Energy Center in Saint Paul, home ice for the Minnesota Wild professional hockey team. This example is Lucy as a hockey coach for the team. That is a role that suits her take-charge personality to a tee. Here we see Lucy in her Girl Scout uniform in ‘Girl Scout Lucy’. Similar to ‘Leadership Lucy’, this statue shows Lucy with dark skin on her right, and light skin on hear left. This celebrates the fact that color and racial background is no barrier to belonging or to achievement. Awesome comes in every color of the spectrum. This Lucy statue is called ‘Reaching Out To Communities.’ It was sponsored by the Saint Paul Foundation, which also operates the Minnesota Community Foundation. These foundations use there resources to help build stronger communities across the Twin Cities and the state. The statue was designed by artist Holly Welch and is on display at the REI store in Bloomington. Update — this statue moved in early 2012, and was seen on display at the Anoka County Farms along Bunker Lake Blvd in Ham Lake.